As I’m entering my second year of woodworking as a hobbyist, I’m pragmatically transitioning into a hybrid woodworker from primarily a power tool woodworker. I’ve still got a lot of tools to add to my collection but am now starting to begin my collection of hand planes. Currently, I own a Wood River block plane (purchased 1st), a Veritas Medium Shoulder Plane (purchased 2nd), and a Lie-Nielsen Bronze No. 4 Smoothing Plane (arriving today via mail). Eventually, I’d like to have a brand consistent set of Lie-Nielsen planes but I purchased the Wood River to try it out and it was cheapest. I enjoy that plane quite a bit and is handy as most block planes are. I’ll replace it when I get some spare cash. My rationale in purchasing each plane was to start somewhere (Wood River), when you need to get up close and personal to some cheeks and shoulders, there’s nothing like a shoulder plane (Veritas), and finally, I own a power jointer and planer so putting a finishing touch on the lumber and the aesthetics alone drove me to buy the Lie Nielsen No. 4. So now I’m interested in purchasing another plane and I’ve heard millions of good things about Jack planes but am wondering if a No. 6 or No. 7 might actually be better since I’ve got a No. 4? If I didn’t have the No. 4, I think a 5 or 5-1/2 Lie Nielsen or 5-1/4W Veritas might be the right plane to purchase next but since I don’t need my next plane to really do any smoothing, I am leaning towards something closer to a jointer. Just wanted to get some ideas if that’s the best next move? I also plan on using a shooting board frequently so a No. 6 would still work for that purpose. Not sure how many people shoot with a 22” No. 7 but it sounds like a legitimate workout if you’re doing it for any decent amount of time. I’m familiar with all the specialty planes as well and as I own a shoulder plane, I don’t quite need a skewed rabbet plane yet (I don’t think anyways). I’ve seen the Matt Elsea YouTube video comparing low angle jack planes from Veritas and Lie-Nielsen and his preference but if anyone has used both before and has any comments, please share. I know that a low angle plane is better on end grain but are there any limitations or downsides to low angle planes? I usually only hear about their benefits. The setup seems a little simpler than a high angle plane and less moving parts so I understand the cost differential (low angle planes are cheaper than an equal high angle plane), so why are high angle planes still so popular. If in my situation, would you go for a low angle Jointer plane like a Lie-Nielsen No. 7-1/2 ($350) or a regular No. 7 for $425? What can a high angle plane do that a low angle one can’t? I realize I’m asking a lot of questions and spinning in circles but if you’ve been in my shoes before let me know what made the most sense after you passed that time in your woodworking career. What are you planning on building next? Decide what you need/want the plane to do. You have a pwr jointer, do you want a manual jointer? You mention a shooting plane ….When you can decide what you want it to do we may be of some help, but you also state LN is the desired brand, so once you decide what the plane will do just go to LN’s website and pick one out. I think the only thing I can offer is I’ve used both LN and Veritas planes, and only Veritas are in my shop. Both are excellent products, I prefer the design improvements Veritas offers. Hi angle planes are for preventing tear out, usually with highly figured wood. Use the lowest angle that doesnt tear out. LOw angle planes/edges are for end grain. Most are bevel up, but Veritas has 40* frogs for their bd custom planes. Atoma diamond plates and a 8000 Japanese water stone keep cutting edges sharp. You’re wise to purchase quality planes, congrats! I don’t have a low angle plane but it’s definitely on my “one day” list. I wouldn’t want to be without my jack but I could get by without my jointer if I had to. And you may not realize you need a skewed block plane yet but after you get one, you’ll realize it ;-) Seriously, if I could only keep 2 planes, they would be my skewed block and my 4-1/2 smoother. If I got to keep a third, it would be my 5-1/2 jumbo jack. Well it’s a good thing their #7 actually weights less than their shooter. Which is a beast. There are some woods where a LA plane would be a better choice but by and large a standard bench plane is the go to. It is the value and versatility of changing the iron in a LA plane that appeals to many. My primary reason for not buying in? It doesn’t have a chipbreaker. You can overcome that in a LA plane by changing to 50 deg or so iron. I’d rather pick up a different plane than change the iron. I recently went to the Lie Nielsen “road show” in Berea KY. Lots to drool over! One of the LN guys was demoing their Low Angle 62. Planing curly maple was no problem… But his iron was ground at 35 deg. As this is a bevel up plane, 35 + the 12 degree frog made an effective cutting angle of 47 degrees! A standard Bailey or bedrock is at 45 degrees… Effectively he was making a low angle plane act like a standard bench plane. I also noticed his lateral adjustment was a brass hammer! I saw the 7 1/2… But for my money the standard bench jointer is my go-to. Thanks all very much. I appreciate your input despite my lack of additional details in terms of what kind of projects I make. I do a lot of work with very standard domestic woods (so far) and the usual higher end plywood. As I’m learning more and more I find simple projects that help out around my garage/workshop and my house. I recently built this screwdriver holder made of white oak. I put in a tier system to differentiate the screwdrivers by height and created the need for a shoulder plane (a rabbet plane would have also worked). The hardwoods that I currently have a small supply of are white and red oak, cherry, and elm. Eventually, when I find a good hardwood supplier I’ll probably add the other domestic hardwoods like hickory, walnut, maple, birch, etc. (I live in Wisconsin, USA). I also will dabble in some of the exotic woods like purple heart, bubinga, etc. I’ll be working on a new project shortly once the design is established, of a tool cabinet much like the style that hangs from a wall, has hinged doors, holds hand planes upright against the back wall, chisels, saws, etc. I do like the idea of a manual jointer because in order to use my power jointer, I might need to pull a car out, roll the machine into place, plug it in, connect the dust collector hose, and then do all the same in reverse order. If I needed a single board jointed, I’d be able to save the power jointer for the larger tasks. 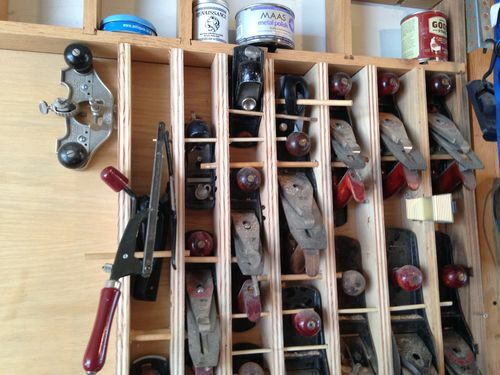 I’m also wondering if you had all the numbered planes except for the jack plane, despite the versatility of the jack plane, and if you weren’t ever lazy, would the jack plane be the best plane in any situation? Example: if smoothing, use a #4 or #4-1/2, if jointing, use #7, if “fill in the blank”, use a #5 or 5-1/2 jack plane. I’m leaning towards a jack, jointer, or fore plane. I don’t yet understand what situation a fore plane is perfect for so maybe I’ll narrow it down to jack or jointer. Considering I’ve got smoothing covered with my new #4, perhaps a jointer plane would suit me well. I’m not sure if the jointer plane is too large however for a standard to smaller size shooting board though. Eventually, I think I’ll end up purchasing both a jointer and a jack plane. Thanks again for the help! A router plane would be a good suggestion. Modern LV or LN. A grooving plane is nice. Record 043/044 or Stanley 45/55. Whatever you do Dan, Don’t let these guys talk you into buying a used plane and restoring it. Once you start down that path there is no way to stop. You’ll start finding them everywhere you go. Yard sales, estate sales, thrift stores, small antique shops. It’s a sickness that has no cure! .....Run Dan! Run away while you still can! Whatever you do Dan, Don t let these guys talk you into buying a used plane and restoring it. Once you start down that path there is no way to stop. You ll start finding them everywhere you go. Yard sales, estate sales, thrift stores, small antique shops. It s a sickness that has no cure! .....Run Dan! Run away while you still can! I m also wondering if you had all the numbered planes except for the jack plane, despite the versatility of the jack plane, and if you weren t ever lazy, would the jack plane be the best plane in any situation? Example: if smoothing, use a #4 or #4-1/2, if jointing, use #7, if “fill in the blank”, use a #5 or 5-1/2 jack plane. I m leaning towards a jack, jointer, or fore plane. I don t yet understand what situation a fore plane is perfect for so maybe I ll narrow it down to jack or jointer. Considering I ve got smoothing covered with my new #4, perhaps a jointer plane would suit me well. I m not sure if the jointer plane is too large however for a standard to smaller size shooting board though. Eventually, I think I ll end up purchasing both a jointer and a jack plane. Thanks again for the help! Part of the problem having a conversation about planes is people use the terminology differently. A jack plane is called that because it’s a jack of all trades, master of none. It’s a decent jointer, smoother or even fore plane and doesn’t excel at any of those tasks. A fore plane is called such because it was the one used before any of the others to scrub, remove warp and dimension the wood. Fore planes usually have a cambered iron and wide open mouth to take deep cuts. A jack plane set up with a cambered iron and used first is also a fore plane. If wanting one plane to do jointing and shooting, a #5-1/2 or #6 can do both really well. While the #7 & 8 sizes are traditionally called the jointer planes, I do at least 95% of my jointing with a #6 size. It’s long enough to get you a very straight edge and flat surface, yet lighter and easier to push around all day than a #7. A 5-1/2 is close enough in size (3in shorter) to have the same advantages. Unless you are doing a lot of large furniture pieces, you don’t need anything bigger. Actually, even if you are doing large furniture pieces, you don’t need anything bigger. The 5-1/2 and 6 also have enough mass and size to make good work on a shooting board. I’ve used a #5 and even a #4 for shooting, but the larger plane is nicer to use. And all that works until you keep going down the rabbit hole and find out that you really want a shooting plane. If you get really obsessed, you go from using and restoring to designing and making your own. That’s a whole ‘nother addiction. Make your decisions based on how you want to accomplish various common steps in the building process, not specific projects. A future project may create the need for another tool, but to get started focus on commonalities. You gonna use your powered toys to dim lumber? I suspect so if you give dim lumber with planes a try, and if that turns out to be true, it changes the discussion on bench planes. I find dim lumber with planes a waste of time – too easy to run it thru power equipment. But I joint, flatten glue ups, and prep all surfaces for finishing with planes. A 4-1/2 and a 7 is all thats needed. A block for misc stuff. Shooting board use to square ends – a 5-1/2 or 6 works, but a LA is sure nice, a LA jack or dedicated shooter. What type of joints will you do? A shoulder plane takes care of most. Then decide how you want to do rabbits, grooves, etc – power or plane. Keep working through the common process steps as a guide to the tools needed. So after getting my No. 4 all set up and in action, I finally got a crystal clear understanding of why grain direction is so important when you’re planing. Even with a razor sharp blade, tear out still occurs if you’re planing the wrong way. So I have some more learning to do regarding the advantages of various angles. I know that low angle planes help prevent tear out but then I’ve also read that a higher angle in a standard bench plane can prevent tear out too? Instead of going at the wood with a 45 degree angle, a 50 or 55 degree angle is supposed to prevent tear out as well? 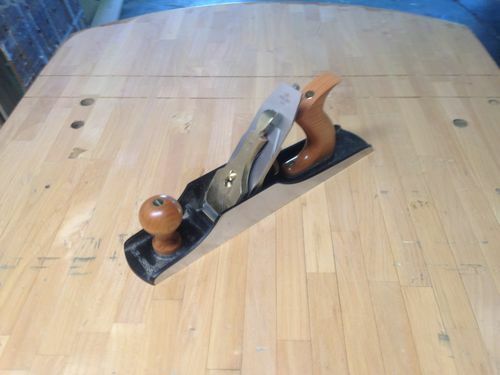 So perhaps the next best plane for me would be a low angle jack plane or a low angle jointer plane. One question that I did have was when I was planing in the correct direction (relative to the grain) and I wasn’t getting any tear out, how would I go about planing the very first portion of the board when I have very little of the plane atop it to register it? In the case of my current project (shooting board), everything is still roughly dimensioned so I can cut off that first portion this time, but in the future, if I turned the board around to plane that little front portion, I’m likely going to get some tear out. Maybe I’d need to switch planes at that point to a low angle one (when I purchase that plane). I’m assuming there are some other tricks out there though so if you’ve got one, please enlighten me.